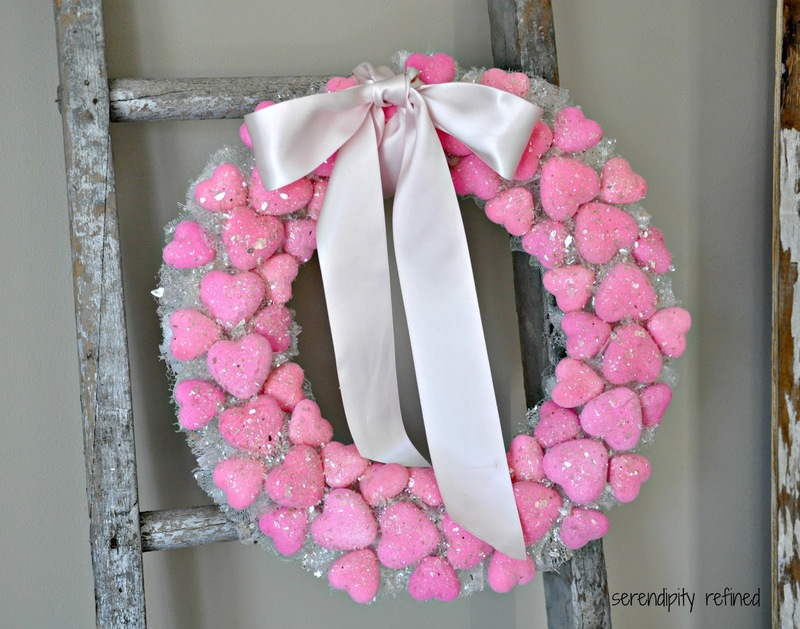 I know that it may seem unlikely but, there might have been something that I could have re purposed into a Valentines Day wreath in the Pet Supply aisle of the store. Seriously..those little pink cat toy mice were pretty darned cute. Well, except for the fact that I'm allergic to the catnip that they were filled with and my dog probably wouldn't have been real fond of them. That's the real reason that I was so intently studying the label...it wasn't because I was stalling while you chose a dog toy. 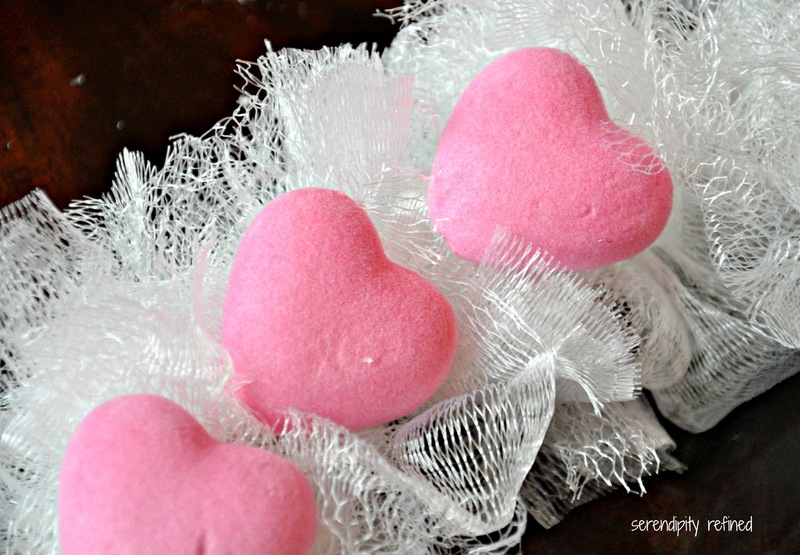 And while I was standing in the Cleaning Supplies aisle for ten minutes, as you were picking up sponges and those cute little red measuring spoons, I was considering whether or not the pink and silver pot scrubbers could be cut apart and reused. You may not know it but after a few minutes, I felt bad about the thought of throwing away the white molded plastic handle that they were attached to. I thought about explaining to you that I'm a blogger and that I like to make things and that I had come to the realization while standing there holding five of them in my hands that not even I can find a use for everything.....so I put them back. It wasn't just because you had moved on to the next aisle. And those pink and white and red and white jump ropes in the Children's Toy Aisle almost made it into my cart. 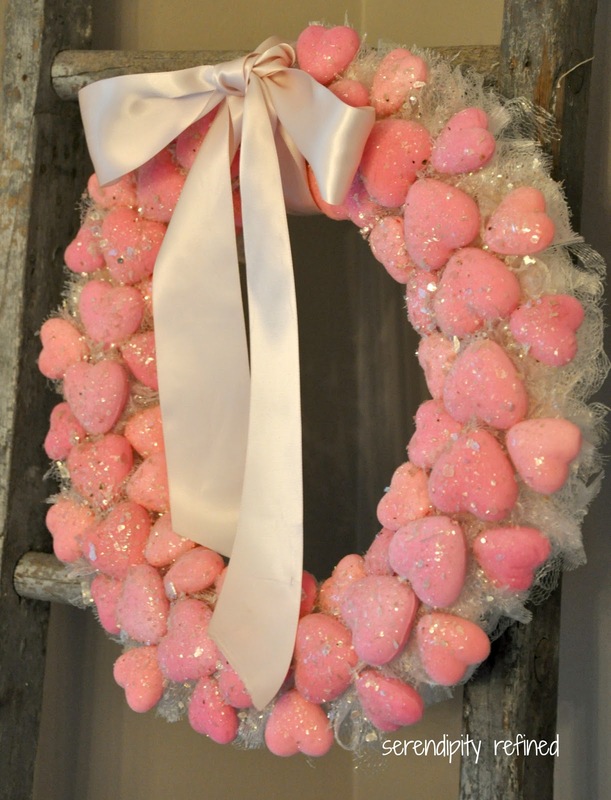 I thought about wrapping them around the wreath form that I picked up over in the Floral Section. I had them in my hand while you were looking at the coloring books but the lack of a re purpose for the handles forced me to change my mind. 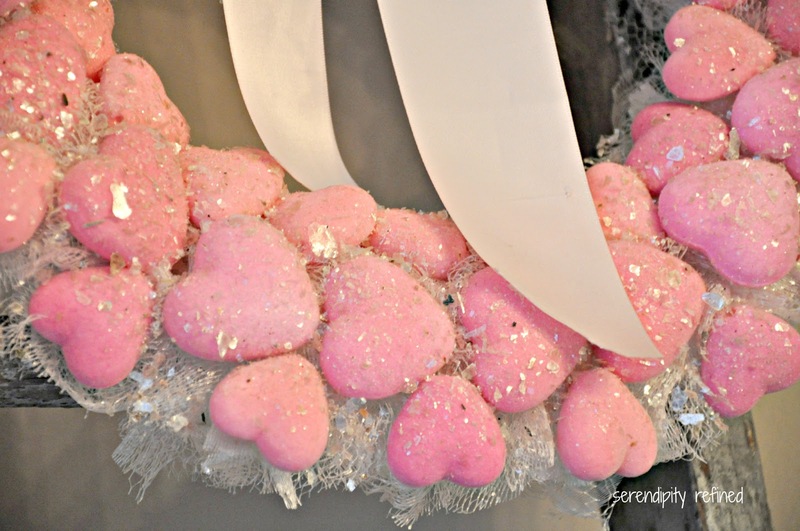 I'm sure that you sensed my excitement in the fact that the Candy Aisle had so much potential for Valentines Day decor. 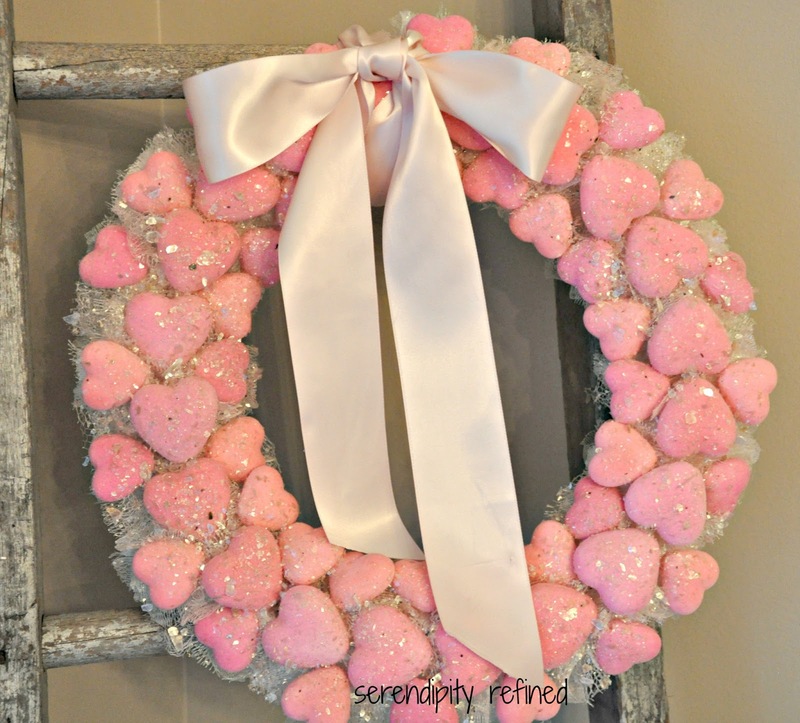 Seriously... who can resist candy hearts this time of year!? 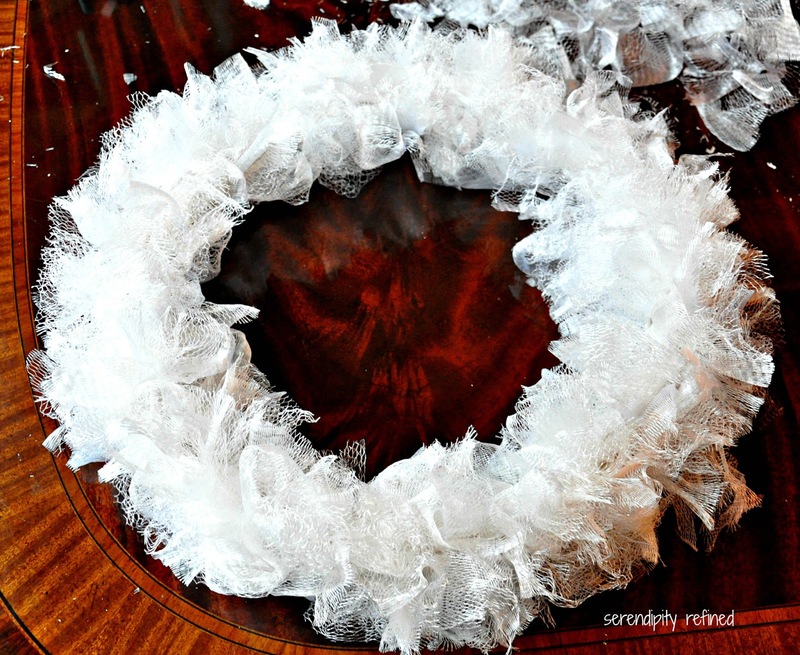 I'm using them to fill glass jars or to glue onto Styrofoam wreath forms. With three boxes for $1, that's the kind of deal that I really can't pass up. I don't care what brand they are or whether or not there's a freshness date on the box which explains my reckless abandon in tossing eight packages of three into my cart. You see, I did notice the puzzled on your face as you were putting the single bag of peppermints into your cart. In case you were wondering, I was also seriously considering the cinnamon red hots, pixie sticks, and the individually wrapped strawberry hard candies but decided that I was better off with the hearts. The Party Supply aisle yielded a pink plastic table cloth, some seasonally appropriate tissue paper, and some garland that might have had potential... but I wanted pink and it was red. You may have wondered why I was rifling through the sixteen pegs full of garland. I confess, I was hoping against all hope that there would be a single strand of pink hidden among the so obviously all red selection. One more thing, I've always wondered how the paper napkins were..I saw that you got several packages...I presume that they must be okay, right?! The aluminum foil pans and non-woven pink laundry bag from the Home keeping aisle went into my basket and I thought that it was lovely that you finally smiled at me and made a cute comment about how we "kept running into each other". 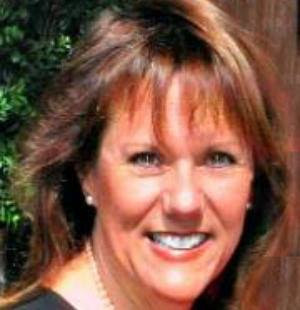 I hope that I wasn't making you nervous and I 'm sorry that we didn't get a chance to really talk any more as I'm certain that we'd have become BFF's by the time we reached the refrigerated aisle at the far side of the store. After I regained my composure. I decided on three plain white puffs. 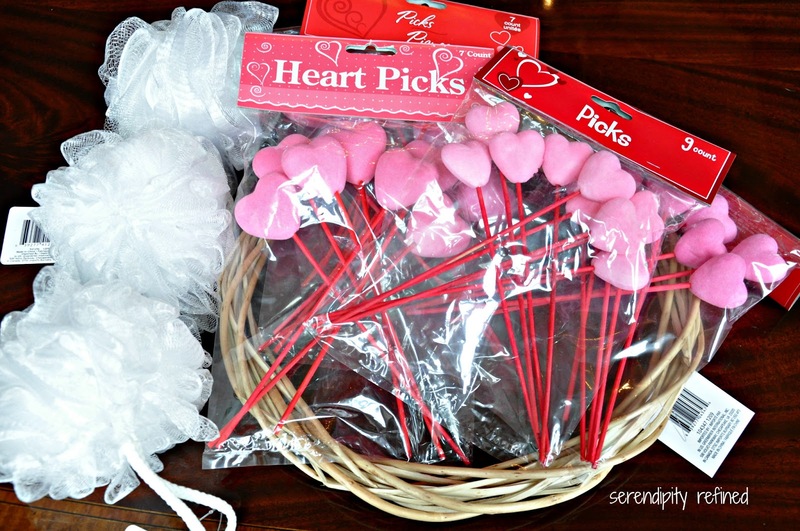 Then, I quickly made my way back around the store, returning the tissue, the table cloth and the laundry bag to their rightful areas and grabbing a few bags of the flocked Styrofoam heart picks as I headed for the checkout. I didn't see you on the line. 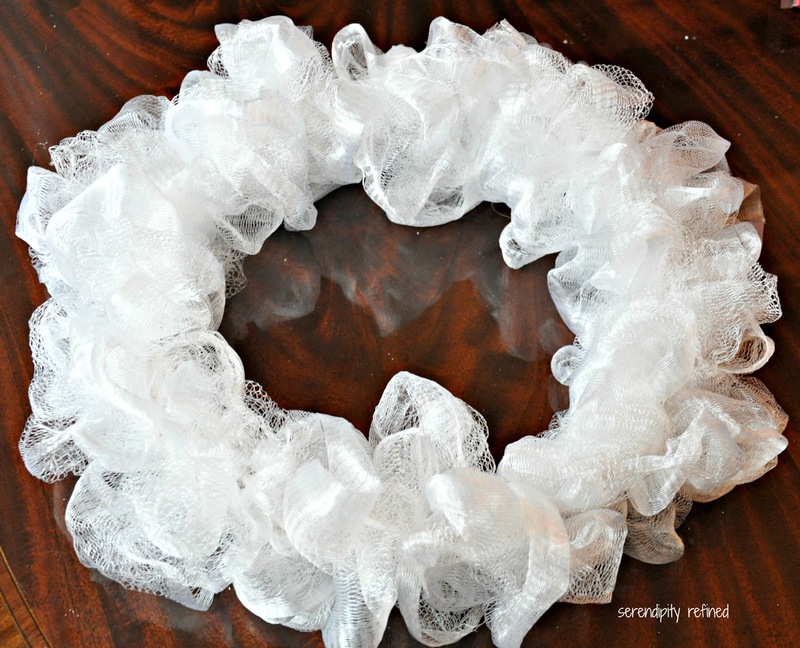 I'll admit that I never did make it to the refrigerator/freezer section.. Once I found the bath puffs, my search for the perfect wreath material was over. 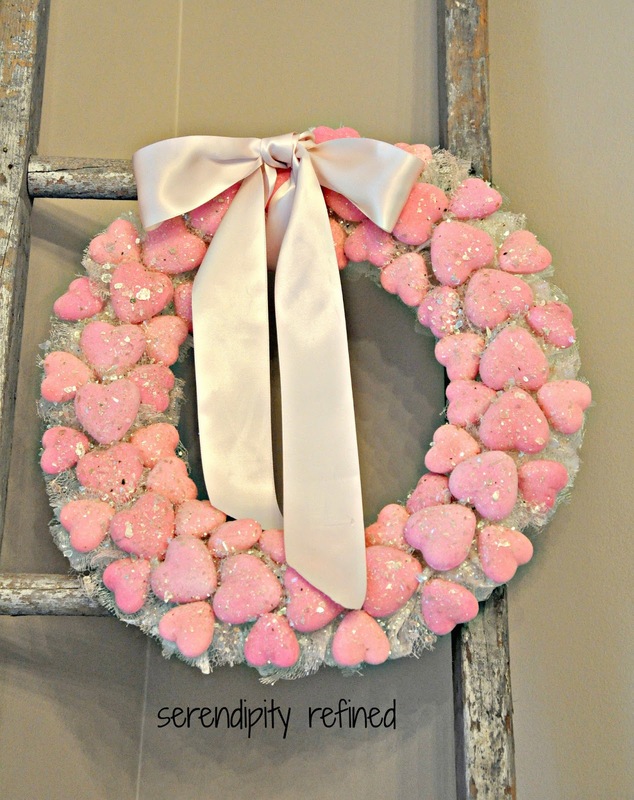 After all, I doubt that yogurt or frozen peas would really hold up very well on a wreath even though it is cold enough outside to preserve them. 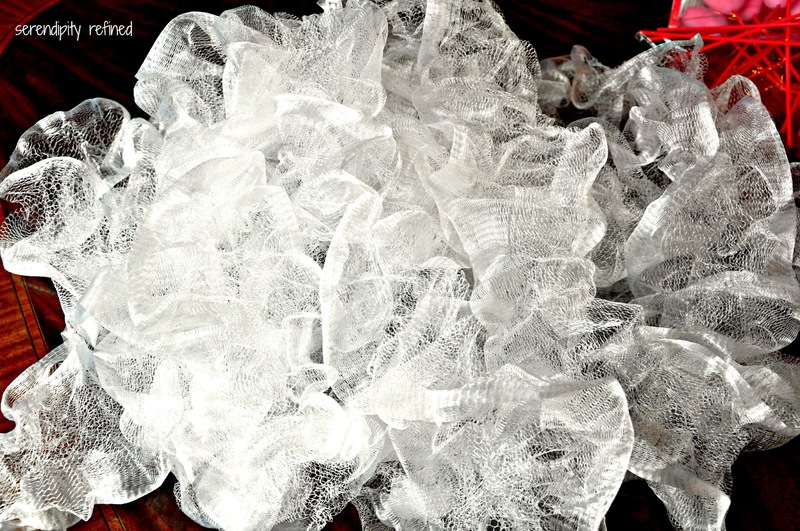 Cut the tie holding the bath puffs. 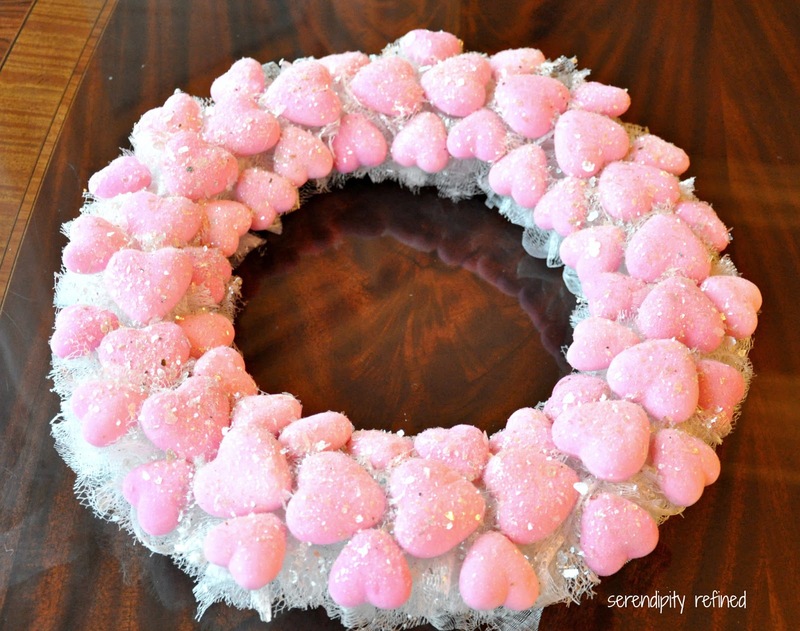 Wrap and hot glue the puff material to the wreath form. 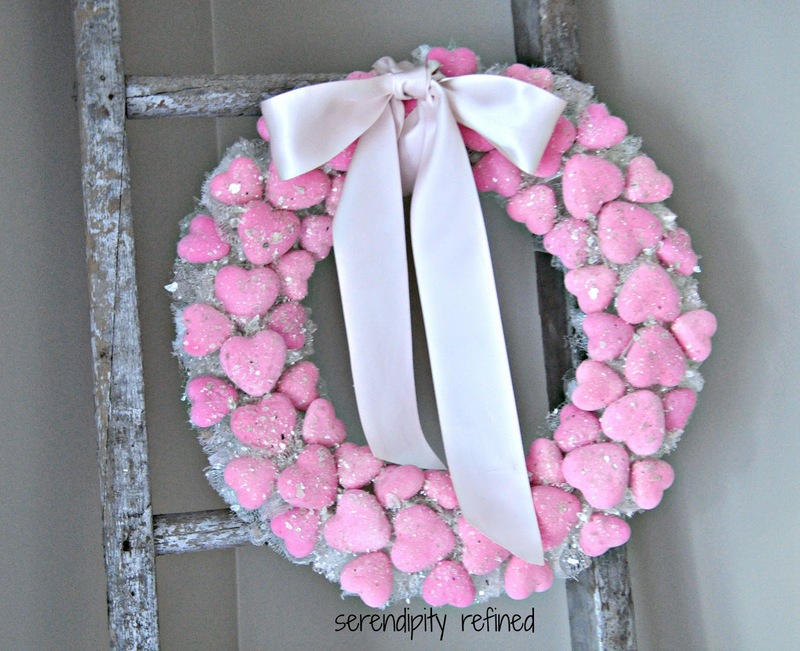 Hot glue the hearts in circles around the wreath. 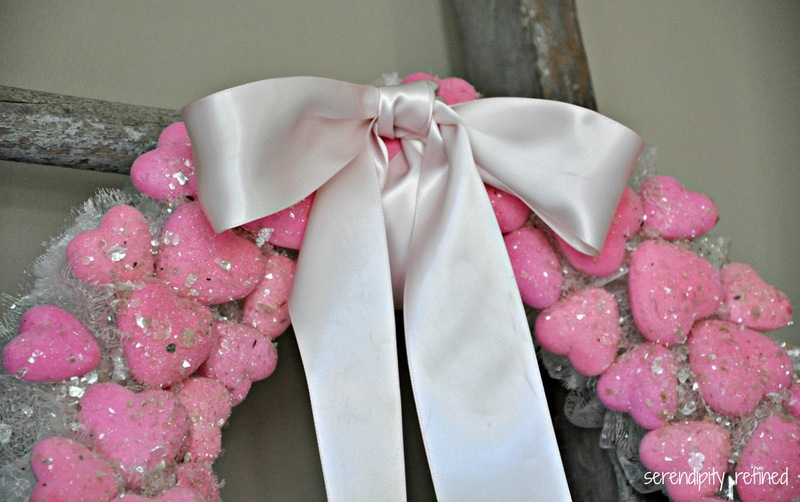 Spray the wreath with adhesive and sprinkle it with mica flakes. So, nice lady from the Dollar Tree, if you're reading this, maybe we'll meet again some day. I hope so. St. Patrick's Day and Easter are right around the corner and I'll be be shopping for supplies on my lunch break. Besides, I'd really love to know what you were doing with all that ivy garland. There must have been eight of them in your cart...not that I was counting.